February 12th, 2017 – Rev. Canon Dr. William J. Danaher Jr. I got to New York City and wouldn’t you know, with the town of 10 million people, I had my opportunity the day I was moving in. We were moving – we lived in this little place and it was on this little street, and they had to bring in the big moving truck. They had to bring in these smaller trucks and they would unload the big moving truck into the smaller moving truck. Then the smaller moving truck would come in and park it in the little street. Then I was working with the workmen because I wanted to save some money. Then we’d have to bring all the boxes up five flights of stairs, and it was July in New York City, a little bit hot. We got the first truck in. We got it all unloaded and then we had to get the next truck. We actually only had one truck. But in fact, she proved to be pretty good at parallel parking, and so all of a sudden, she’s getting into the space and I couldn’t believe I hadn’t inched enough forward. I couldn’t believe I was going to lose the space. I was getting a bit frustrated and then all of a sudden, she backed a little bit further in and touched my car. I was sitting there with all the other guys and I got up and I didn’t say, “Screw you!” I said something a lot more articulate. I said something like, “Oh, you hit my car!” like this. Then she looked at me and then she reached over and locked the door. Then suddenly I felt this horrible experience, because I was hoping for at least – in New York, the way this works is you say, “Screw you!” and the next person says to you, “Screw you!” That’s the way it’s supposed to work. But instead she locked her door and looked at me with fear. I realized a large sweaty man on the street might not – I might not have communicated exactly what I was hoping to communicate. She gave me the keys to her car and then she was walking down the street and she did this thing like, “You really are a priest, right? I can trust you, right?” I said, “Yes, you can trust me and yes, I’m really a priest.” I moved her car and we moved the truck in and we got everything else in. She came back about 7:30, 8:00 and got her car keys and drove home. I’ll never forget that moment in which she trusted me with the car keys after I had said, “Screw you,” kind of to her. I’ve been thinking about that and unpacking it in my brain for a long time, because in so many ways, it resonates with I think the message of today’s gospel. We could read this gospel that Jesus gives as an invitation to think of all the things that we inevitably are disqualified by for living the holy life. To not be able to say, “You fool,” and run into hellfire. To experience desire which seems to be perfectly natural. It seems as if Jesus is trying to articulate something that is so high and lofty and above ordinary people like you and me, that it’s hard sometimes to take this gospel of Matthew seriously. I think actually that gospel is about the here and now, and it’s about fleshy human beings like you and me, and about normal human interactions that you and I have with each other. Because when Janet forgave me and gave me her car keys, she wasn’t living in a lofty other place. She was making the here and now livable for me. She was living into what it meant to be Jesus’s disciple here and now. Her beautiful act was a moment in which she contributed to the beauty of this world, the kind of world that Jesus is bringing into being through the gospel that he preached and through the gospel that he embodied. I think maybe that’s what’s at stake in today’s gospel is for you and I to recognize the way in which these words are about the deep social trust that you and I need in our communities and lives. So that we can go forward as the body of Christ in the world around us. So that we can be knit together. So that we can be who God has called us to be. Because it is fun to dream up these moments where we say, “Screw you!” to a perfect stranger. But in fact, no one is a stranger to God and everybody has a face that is hiding an enormous story behind it. Everybody has a struggle that they’re involved in, and we all need people in our lives to reach out and forgive us and to reconcile us and to make life more possible for each of us. This social trust, this bond that you have as a community, that’s what Jesus is trying to articulate in today’s gospel. The Kingdom of Heaven becomes a kingdom on this Earth when the disciples of Jesus learn to relate to each other in ways in which these deep relations to each other, these deep vulnerabilities – when all of these things become something that is kind of given. A bedrock – a thing you can rely on. People you can rely on. Today’s gospel is about the here and now. It’s not from another place. It’s not words written on a cloud. It’s about how we make our lives better today. All of this, I think, has an important application to where we are today as a community and as a nation. Because if there’s one thing that I can articulate that we are experiencing in the here and now is we had a breakdown of social trust. More than anything else, there’s been a breakdown of social trust. We don’t trust one another like we used to. We don’t trust the institutions that serve us. We’ve lost faith in the things that bring us together and hold us together. What we’re called to be in Christians in this time and place, I think, is something quite different from what we might be expected to do. Earlier this week, I was in retreat with a bunch of clergy and they were trying to articulate where they sat with all of the things that are going on in our country. Many of them wanted to be prophets and many of them wanted to be pastors. Many of them wanted to speak bold messages of the truth as they saw it, and many of them wanted to be pastoral and listen and hear what everybody is saying. Suddenly, it occurred to me that Jesus wasn’t just a prophet and Jesus wasn’t just a pastor. I asked them, I said, “What does it mean for us to be a priest? What does it mean for us to have our priesthood and form our witness?” Everybody was silent and I didn’t say anything else because I wasn’t really sure if I’d said something right or wrong or inappropriate. What I think being a priest means is engaging in these embodied acts of trust and love and reconciliation and forgiveness. In that moment when Janet gave me her car keys, she engaged in what a priest would do. She was a priest to me that day and her priesthood, the priesthood she exercised restored the community between us. You see what I’m saying? I think that what you and I are called to be in this time and this place and these times that we live in, given our differences, is to bear witness through our own priestly acts of the presence of God in this community that makes us special and different. The kind of embodied actions in which the word of God is made flesh through our acts of reconciliation, forgiveness, acceptance, love for ourselves and others. It’s not a great political vision. I’m not going to get on CNN for this. I believe this is what God is calling us to be in this time and this place with all that we are and all that we believe. The piece of art I have for you today expresses that priesthood I think in a powerful way. 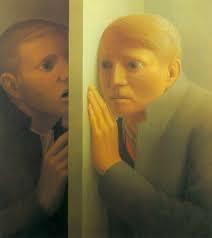 It’s by George Tooker and George Tooker was an interesting painter. He’s someone who’s gotten more famous after he died in 2011, which is often the case with painters. Tooker had a high reputation in the ‘50s and ‘60s, and then when abstract expressionism came along, he lost his prominence because he loved to do these haunting figures of people that look a little bit like statues. His intent in these depictions was to depict the impression that reality creates, he wrote, on a dream. These are experiences that we have all had but we are mixing them up in our minds a little bit. This piece he did that reflect on the tensions and conflicts that were going on in the late 1960s and early 1970s in the United States. This piece is called Voice. There you have two individuals who are separated by a thick wooden door or wall. On one side, one person is trying to speak, and on the other side, someone is trying to listen. There’s this incredible moment of trust in it, and this incredible vulnerability because the person who is speaking into that wall doesn’t know that the person on the other side is trying to listen. The person who is trying to listen doesn’t know if there’s someone trying to speak a word to them through that wall. Each of them is in their own reality and trying to reach the limits of that reality by daring to say something and daring to listen. Tooker converted to Roman Catholicism late in life and I think this is the most priestly of his paintings. Because one of the things that a priestly imagination does, and one of the reconciliation acts that a priest does is you are able to see both sides trying. And you try to lift it up and you try to bless it, and you try to see the mystery in it and you try to live into that mystery yourself as you speak or listen even when you don’t think there’s anyone on the other side. Voice is a commentary on the tensions of the late 1960s, but I think it’s something that resonates and goes with the grain of where you and I are today. Something that goes with the grain of who God is calling us to be, and it gives us an image of the witness each of us I think is called to bear. Amen.